Sweet and spicy, these juicy skinless tamarind-glazed chicken thighs are easy to make and are perfect served with crisp lettuce on the side. If you want to make this with skinless, boneless breasts or thighs instead of bone-in meat, you can; just reduce the cooking time by five to ten minutes. From Melissa Clark’s new cookbook, Dinner: Changing the Game. Her book is filled with 200 flavorful dinner recipes, organized by main ingredient, complete with stunning photography. Great for cooks looking to step up their dinner game as she uses ingredients that may require a trip to a specialty store, such as harissa, tamarind paste, preserved lemons, etc. Luckily, you can also find everything you need on Amazon. In a large bowl, whisk together the fish sauce, soy sauce, honey, sesame oil, tamarind, chile flakes, lime zest, and garlic. Pat the chicken dry with paper towels. Add the chicken to the sauce in the bowl, and turn to coat the pieces well. 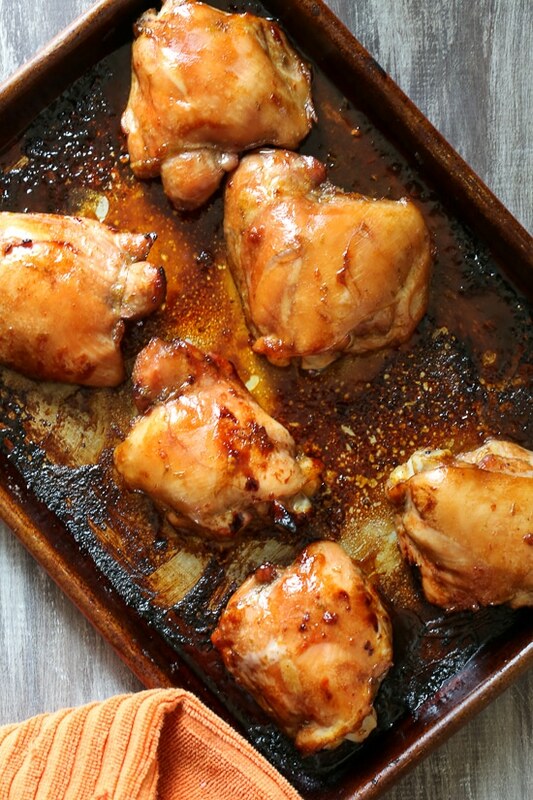 Arrange the chicken on a rimmed baking sheet, and pour the sauce over it. (If you like, you can refrigerate the chicken at this point, covered, for up to 24 hours.) Roast, turning the chicken occasionally, until it is cooked through and caramelized, 30 to 35 minutes. After roasting, if you wish to brown run them under the broiler 1 or 2 minutes. Top the chicken with plenty of black pepper, cilantro and jalapeño slices if desired. Serve over lettuce leaves. Severe fish/shellfish allergy*** could anyone recommend an alternative for fish sauce? 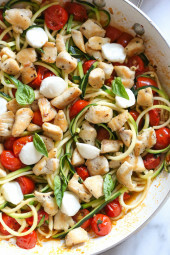 I generally avoid the recipes that have fish but this looked so good! “I made this recipe as directed. There was not glaze. The chicken was cooked through by in a watery marinade. I broiled it but it was still watery. And I was not impressed with the taste.” Ain’t no glaze here. W-a-t-e-r-y. A longer marinade and reserving some glaze to brush on for a broiler-minute at the end seems required. The pan sauce blackened but the chix didn’t. And where the heck is the little bitty half-tablespoons of tamarind flavor at? My whole family loves your recipes! My son has a fish allergy, so I can’t use fish sauce. 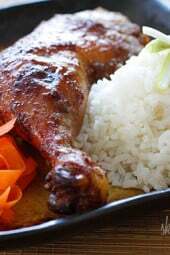 Can I substitute extra soy sauce, or is there something else I could use? I would just leave it out. This recipe wasn’t the greatest thing I’ve ever made. I followed the recipe exactly. It seems like a lot of preparation for something mediocre. And it stunk up my house. I’m not sure if what went wrong but I could taste was the fish sauce even if I doubled the quantity of tamarind paste. This was amazing – total staple in my house for busy weeknights. Because of Skinnytaste I can now make healthy, home cooked meals almost every night even though I work crazy hours. Thank you!!! If using boneless thighs, what is the cooking time!? 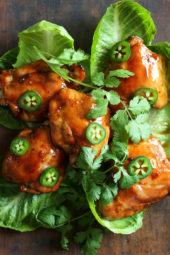 Thanks – these are marinating in my fridge right now! Are the recipes on this site yours? Or do you post other recipes from other chefs as well? Gina credited Dinner: Changing the Game by Melissa Clark for this recipe, which I just got for Mother’s Day. Gina’s review is accurate. It’s full of great recipes. Most are mine, but I was asked to review Melissa’s book. More of your recipes. This was the first and was divine! The flavours are strong and amazing. My dad and hubby also really liked it and they are hard to please! I made this recipe as directed. There was not glaze. The chicken was cooked through by in a watery marinade. I broiled it but it was still watery. And I was not impressed with the taste. Not sure what went wrong. I usually love the recipes from this site. Mine was watery too and the sauce burned on the edges of the pan. When u say turning the chicken occasionally do you mean actually turning or flipping! Thanks! Simply amazing! Thank you, Gina. Made them last night and will make again next week! Glad you enjoyed them Evelinne! I just made this tonight…. I keep nibbling at it when waiting for my BF to get home! I used chicken breast and turned out great as well! I used a meat thermometer to make sure I didn’t overcook the chicken; it is so tender and flavourful! Definitely a repeat-dish! And I plan on using this a stir-fry sauce in the future with any meats and veggies! Made this last night. Absolutely DELISH!!! What is the flavor of tamarind similar to? Thank you. Does it matter very much whether you are using the tamarind paste vs. the concentrate? I have the concentrate and it is more like a syrup than a paste. And do you adjust the quantity depending on which you are using? Trying to convince my wife to make this for dinner tonight. Fingers: crossed…Can’t wait! Did she make it? Maybe you should give it a go! I have used basically this same marinade/glaze on pork chops and salmon. It’s delicious, but I use LOW SODIUM soy, teriyaki, and hoisin, and reduce the amounts and the fish sauce. 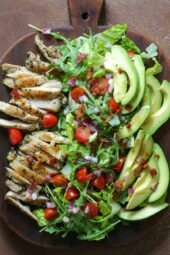 This is also good if you shred the chicken, top with a little glaze and peanuts or crispy rice or soba noodles and put it on the lettuce leaves and use as a wrap. Could this be right? 1200 mg. of sodium? yes, it’s the fish sauce and soy. You can use less.